Good Morning Quilters and Quilt-lovers! 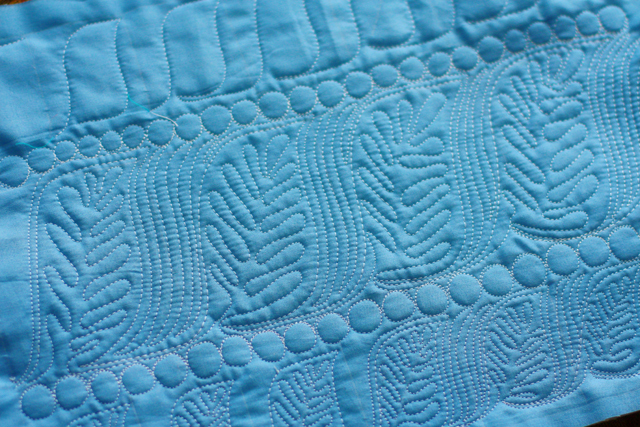 Today is Tuesday and I have a tutorial for you of my All-Time Favorite Quilt Motif–The Welsh Leaf. I saw this on a Welsh quilt years ago and have stitched it onto many of my quilts since then. It is on The College Doodle Quilts and The Quilt I Threw Away. It looks great in all sizes and in many variations. To begin, draw two lines. In the sample below, the lines are 4 inches apart. Next subdivide the lines by drawing perpendicular lines every three inches. 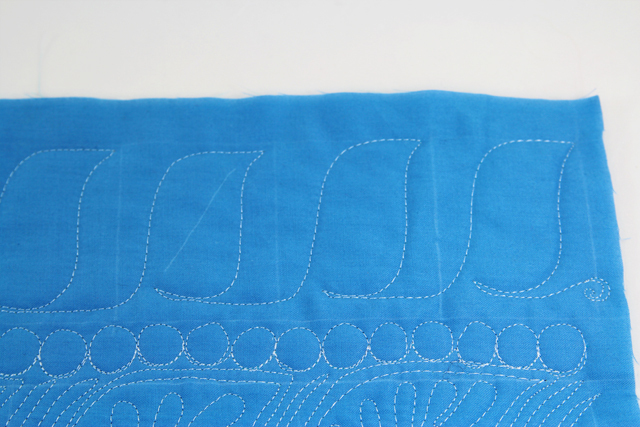 The size of the box is not that important–This motif will fit into your quilt in any size. 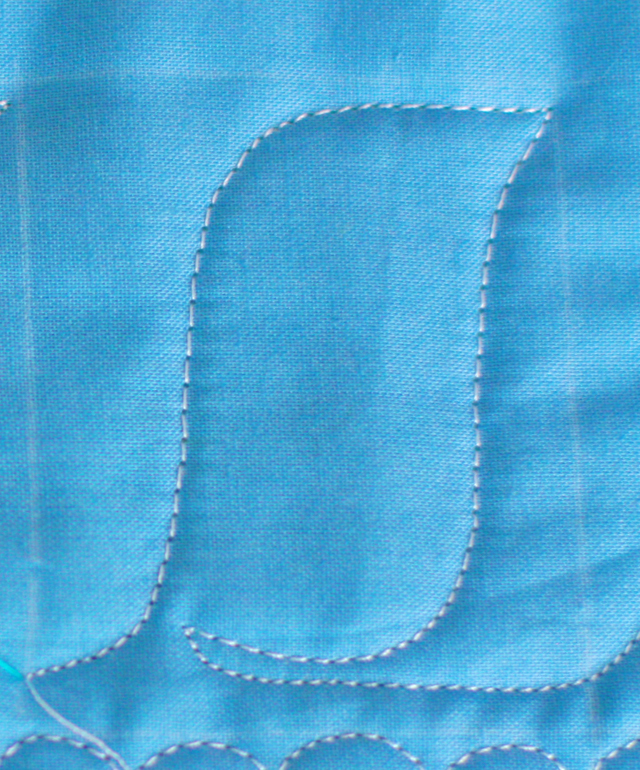 I like a 3:4 ratio, but I have stitched square leaves that looked great, too. 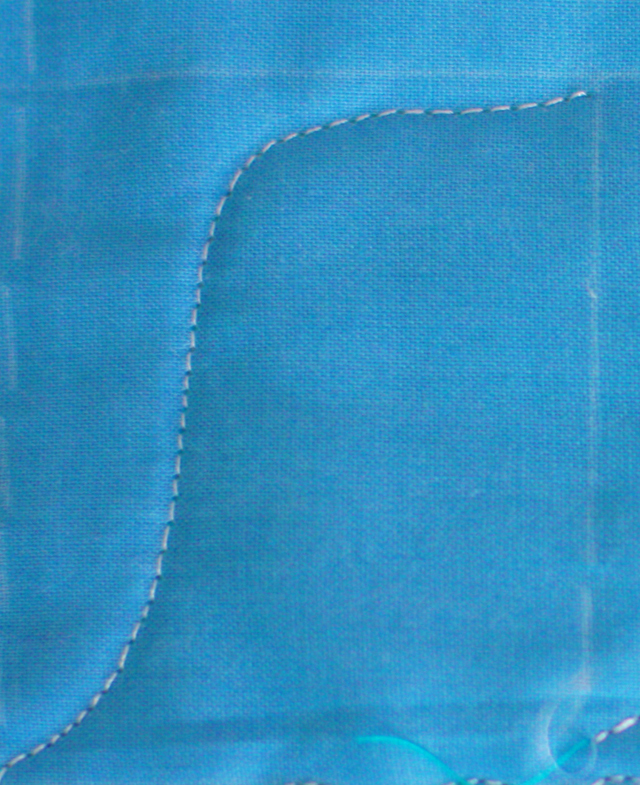 Begin by stitching along the bottom rail and curving up toward the top rail, then stitch across the top rail. Stop here. 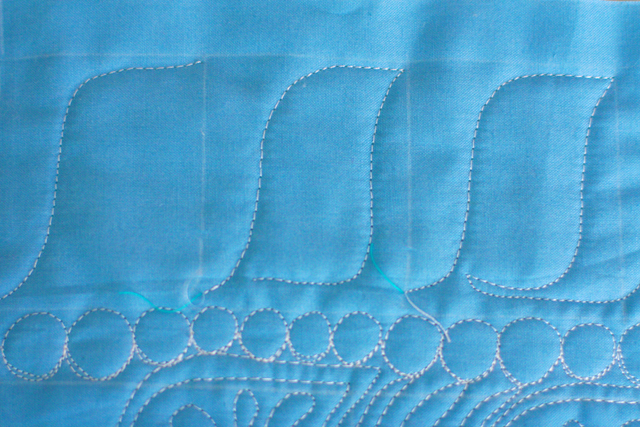 Stitch as many as needed to fill your border. Once you are finished with the “first pass”, draw a diagonal line across the leaf from tip to opening…This line will serve as the center “vein” for your “second pass”. Begin the “second pass” inside the first leaf. Stitch curvy lines up the leaf, then stitch back down the leaf…If you would rather have pointy “veins” in your leaf, that would look nice as well. 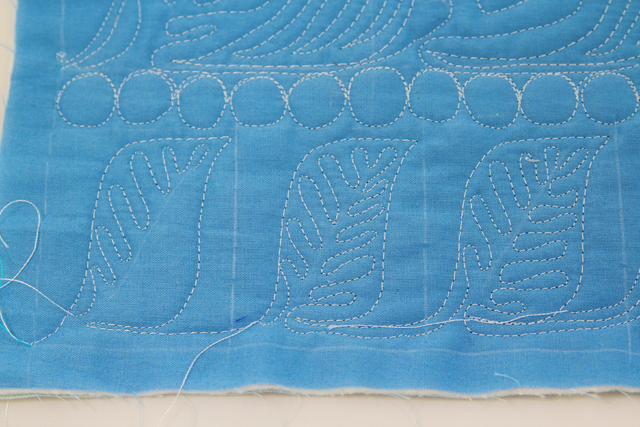 When you finish the veins in the leaf, echo quilt along the bottom and into the next leaf. 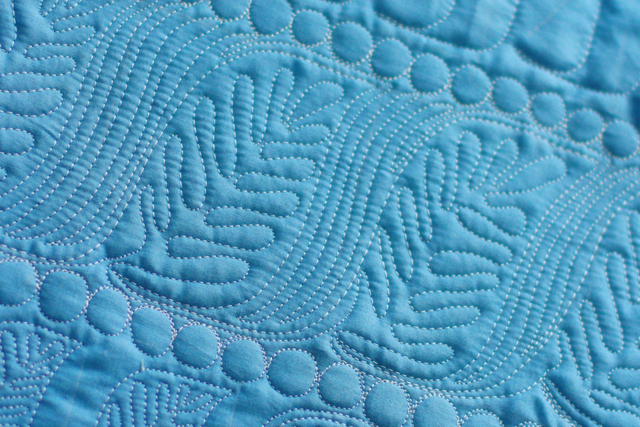 If you would like, you can fill in the space between the leaves with a few echo-quilted lines…sometimes I add spirals between the leaves. I just love the character of The Welsh Leaf. Even when they are not perfectly uniform, they add charm to any quilt. That looks greats. Thanks for breaking down the process. Very helpful indeed. Wow, thank you for such great close-up photos and explanations! I don’t know how you do all those great shapes, turns, and twists! It looks beautiful. I’m so glad the photos are useful—I could quilt all day—if the garden, the housework, the family didn’t call…Okay. I could never quilt all day. Too many fun things to do around here! Thank you, Lori. A neat and simple tutorial to follow and a new inspiration for me! I hope you can find space for it on your next quilt! It fits into so many quilts! 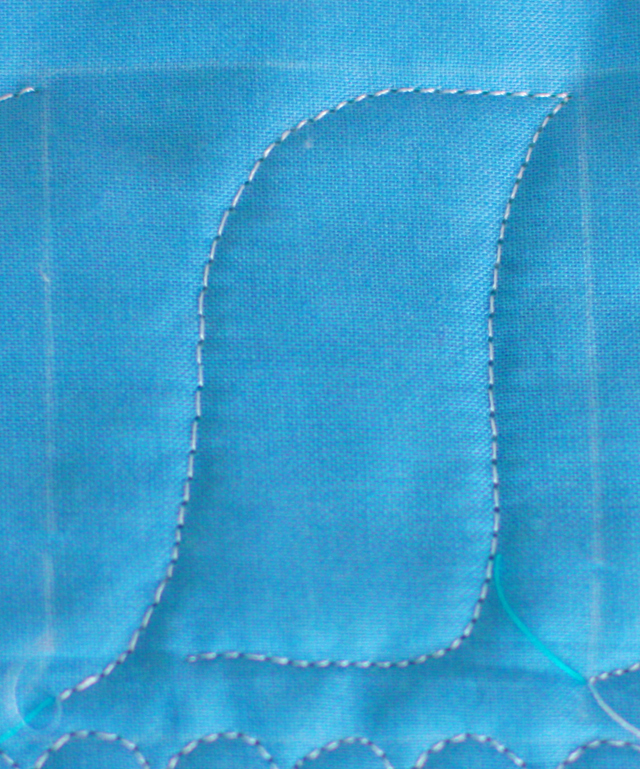 This is another great free motion stitch. Thank you, Joy! I use this motif a lot! I just wanted to tell you that I enjoy reading your posts so much that I have nominated you for a WordPress Family Award. 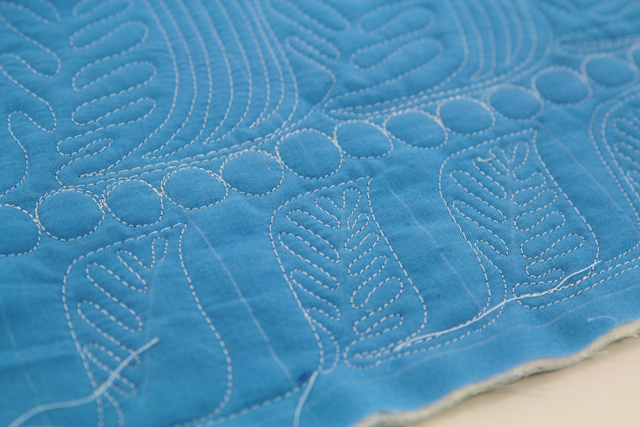 Thanks for sharing all the great Freemotion quilting with us.